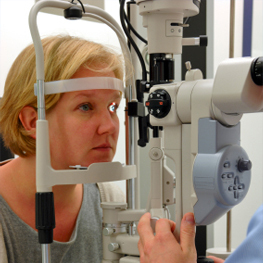 The sight test is so much more than a simple refraction – it is an ocular health examination and an assessment of factors affecting general health. Vision (how well you see), External Eye Examination and Internal Eye examination (ensures a check of the front and internal structures of your eyes), Ocular Motor Assessment (ensures the eyes work together as a pair), Objective and Subjective Refractions (assessing your need for spectacles by measuring the way light enters and leaves your eyes as well as fine tuning of that prescription), Tonometry (measures your intra ocular pressures important in conditions like Glaucoma) and Visual Field assessment (assessing your peripheral vision and the how healthy your Optic Nerve is). We take care to fully involve the patient throughout the examination and in the final outcome we ensure that all queries or concerns are satisfied and relevant wishes and factors are incorporated in the final prescription. Of similar importance is the selection and professional fitting of spectacles and complementary ophthalmic lenses and our Optician will guide patients through the sometimes daunting process of making the correct choices. The wrong choice can be an expensive outcome and we take every opportunity to avoid that possibility. With something approaching one thousand frames from various companies – each one different – and a myriad of lenses,we aim to offer probably the best choice available. We offer digital retinal imagery as a part of our extensive private eye examination. This enables us to capture a precise overview of ocular condition and to retain this in a computer memory for comparison at a subsequent visit-an invaluable tool in the objective assessment of continued ocular health. We urge also our NHS entitled patients to do so for an extra small supplement.